and... well frankly -- we're bored! Christmas is over, school's back in session and everyone is just bundled up in their cocoon. This is always the slowest time of year at the studio. We had a fun little burst of activity with some theatre events; the Quincy Community Theatre Quilta Awards, QCT's "Shrek", and the QHS Winter Play, "The Heiress". And of course our annual Valentine Special is going on (Valentine's Day is over, but the Special lasts till the end of the month)... but mostly, we're looking for some excitement. What is a Winter Wake-up Event? Do you have an idea for an off-beat picture? Now is your chance to be creative. Have some fun, think outside the box (or picture frame). Bring your ideas and inspirations. It can be just you, your family, your kids... group of friends... group of strangers(? ), you name it! Be silly, fun, crazy, daring, edgy, creative, artsy..., outrageous! Gather your ideas and call 217-228-1385 (or contact us). We'll talk, we'll plan, and then we'll schedule a time for whatever crazy thing you can think of. Once again, it's our annual Halloween Open House on Friday, October 31 between the hours of 11AM and 6PM. Parents are invited to bring children, in costume, to the Coonrod Photography Studio at 20th and Jefferson and have a special picture made in a festive Halloween setting. Costumed ghosts and goblins who bring a new unwrapped toy donation will receive a 5x7 portrait, absolutely FREE. Donated items will be given to the Quincy Salvation Army for their “Toy Town” Christmas drive. New unwrapped toys can be for any age child. We’ve been doing our Halloween Special for many years, and people really look forward to it. We love to have fun and see all the kids in their costumes. This year, Halloween is on a Friday, and there’s no school in Quincy, so we decided to extend the hours and try to make it extra special. We’re looking for a great turnout to help us collect lots of toys for children who might not otherwise have many presents to open this Christmas. By popular demand, we're also adding something new. This year, after the children are done at 6, adults in costume are welcome from 6:30 to 8:30. The same special will apply, a new unwrapped toy in exchange for a free 5x7. Halloween has become just as big, if not bigger, as a holiday for adults. We thought we would give grown-ups a chance to get in on the fun too before they head out to their own Halloween festivities. We had the privilege of photographing scenes of the upcoming QHS Winter Play on Monday. Look for our pictures in the showcase, out in the lobby, and be sure to visit our online gallery where you can see all the images from this play, as well as other QHS productions -- all the way back to 2001! 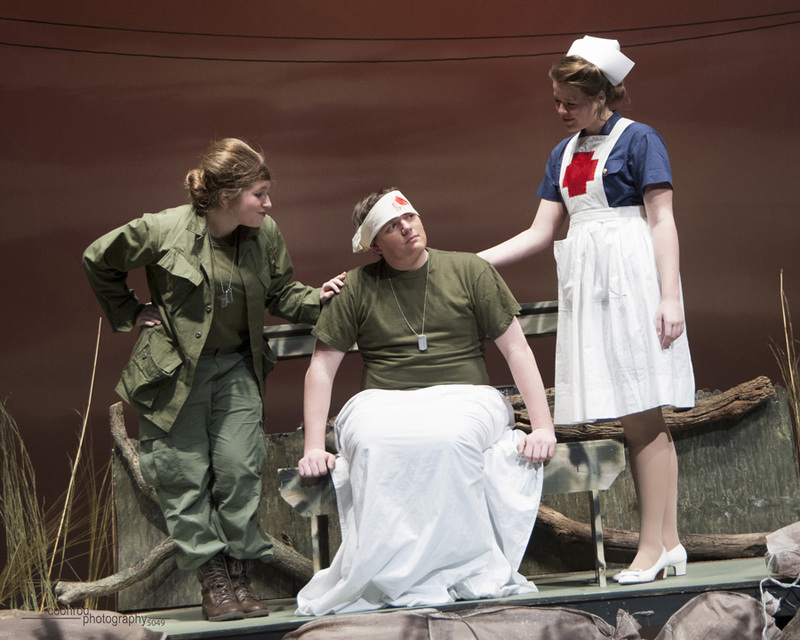 The QHS Winter Play is usually a drama, and this one is no exception. "A Piece of my Heart" is a play by Shirley Lauro that follows the experiences of six young women in Vietnam during the war. The set and the costumes are great, and the cast is exceptional. We are looking forward to seeing this production -- it promises to be very good! 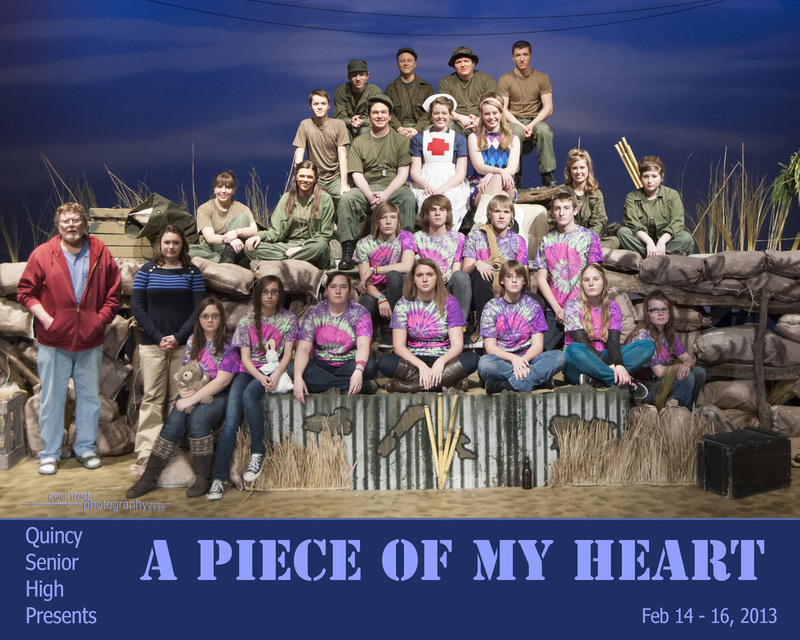 "A Piece of my Heart" runs February 14, 15, and 16 at the Quincy Senior High School Theater. Back in June, the Quincy Chamber of Commerce met down at the riverfront for a group portrait, celebrating the 125th anniversary of the Chamber. The picture was inspired by a historic photo from 1911. We've had a new website on the back burner for about 6 months now, and with the beginning of a new year, we decided it is well past the time to slide it to the front. We've always had comments on how much valuable information was available on our old site, so we want to make sure you can still find out everything you want to know about all of the things we do at Coonrod Photography, and how it all works... but we also wanted to add more pictures for those who just really want to SEE what we do. We hope this new platform makes it easier to both see samples of our work, and to learn all about HOW we work too. In the next few days, we will be adding new pictures and lots new articles, so keep stopping by!